A question came up on our Facebook Group ‘Caravan Adventures ‘ about removing dirty streak marks on the external caravan walls. With a few exceptions, that may also work well, the overwhelming response was ‘Silky’. As we did have numerous streaks that no amount of rubbing with a soapy sponge would remove, a tub of ‘Silky’ went on the shopping list. In addition, we felt some cleaning of the caravan water pipes was in order before our forthcoming 50 day European trip. 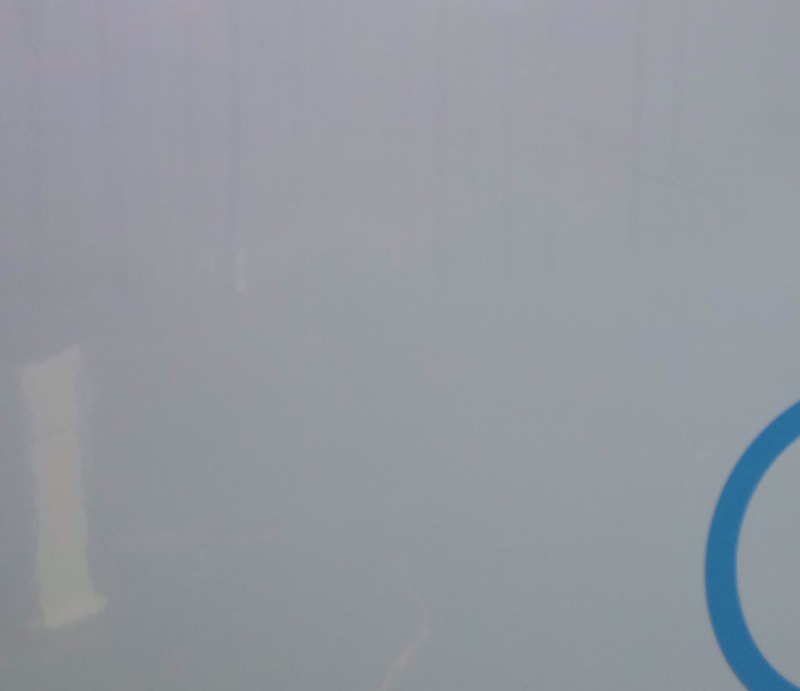 Recently, we have started to wonder if the occasional ‘dicky tummy’ while in the caravan, plus the water not tasting ‘quite right’, was attributable to something lurking within the pipes. Talking with others and specifically an excellent write up on yet another Facebook Group we opted for the advice to use Puriclean, as it seems, quite obviously, unattended, there will be things lurking in the pipe work. Staying at Morn Hill Caravan and Motorhome Site we dropped into Winchester Caravans with a ‘Tenner’ in our hands for the products mentioned above and, like you do, walked out £67 lighter with a bag full of caravan goodies. 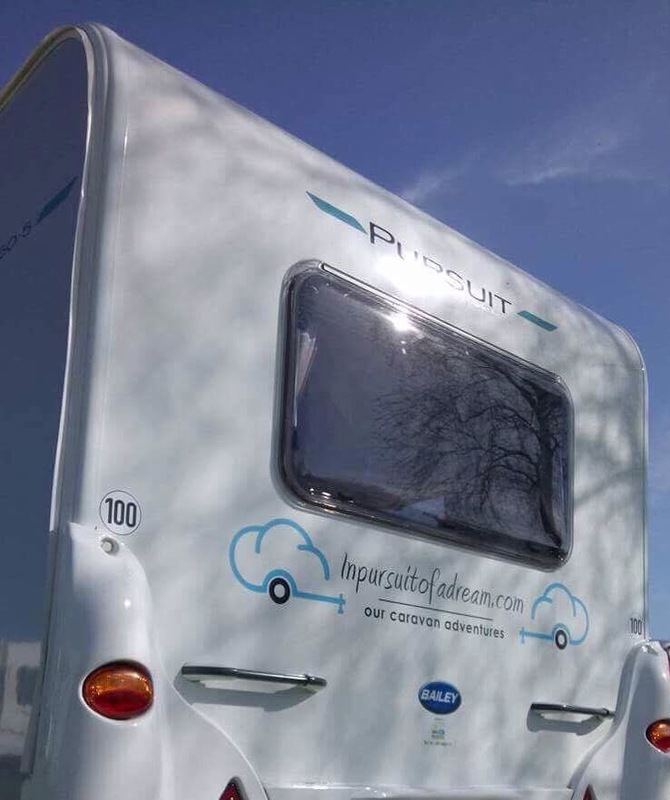 We could have saved money on the internet no doubt but you can’t beat a good mooch around a caravan shop, plus, sometimes it’s reassuring to get genuine advice from knowledgeable staff or shout out a list of items while they locate them instantly. Anyway … I digress. Silky … Approx £4 … I used about a quarter of the tub, this did complete front and back plus selected areas on the side walls. Applied with a damp cloth at first I thought it would not clear what was, admittedly, stubborn streaks as nothing seemed to be happening. I soon found an effective routine as it seemed to remove the streaks as it started to dry on the surface and become a bit ‘grippy’ under the cloth, keep the cloth damp as you rub surface clean then use a second dry cloth to buff to a shiny surface. I found the streaks on the side walls, typically under seams and fittings, removed quite easily and overall the result is excellent and very glad we used it. In the picture below, hopefully you can see the streaks in the top half and in the bottom half you can see a shiny reflection of an EHU post and orange electric cable. Not easy to picture as the streaks were invisible to human eye at a distance of 6ft. 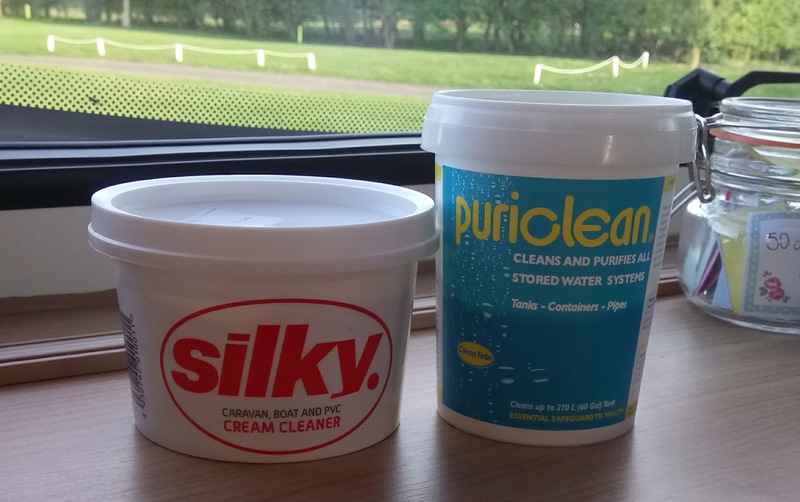 Puriclean … Approx £6 … I used just over a third of the tub, dissolve 9 teaspoons in a jug before adding to your 40L Aquaroll and give it a good shake, or a good roll if you are not Geoff Capes. Probably a good idea to stand for an hour to clean all the Aquaroll, short on ‘wine time’ we immediately drew the water through every tap, including shower, until the water ran slightly cloudy and a chemical, almost swimming baths, smell was evident. Note, hot water will take longer as you draw approx 5 extra litres through the water heater. The container states, leave in pipes for 1 to 12 hours, so we retired for wine … 12 hours later, hic, we drew a bit more through each tap, no reason, just for luck, then emptied the Aquaroll and refilled with fresh water, drawing through every tap until clear and odour free water came through. To be honest, this took ages and a further 40L of fresh water, so be careful to watch your waste water levels to avoid flooding the site. One bonus, your wastemaster gets a clean too. Result? Yes, impressed, the water is tasting much better and doesn’t have that ‘Off’ taste we recently noticed. It is recommended to complete this process twice per season, one of which to be at start of season if caravan has stood for a while. Two good products recommended by the caravan community, thanks folks.